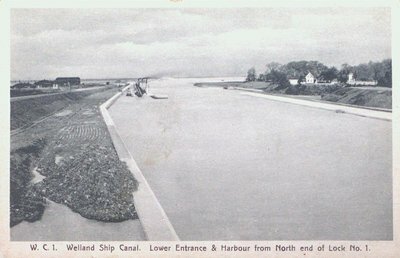 A postcard of the Welland Ship Canal (fourth canal) showing the lower entrance and harbour from the north end of Lock One, Port Weller, St. Catharines, Ontario. Published by F.H. Leslie, Limited, Niagara Falls. Printed in Leipzig, Saxony. c1930s.